A week after rolling out Steam for the Mac, Valve says that Portal is one-fifth as likely to crash on a Mac as it is on Windows. Things have apparently been going swimmingly since the Mac version of Steam was unleashed upon the world. 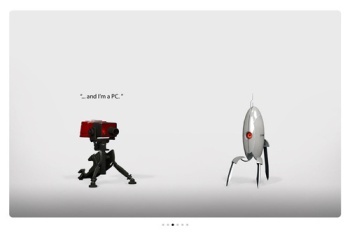 Portal, which Valve started giving away to mark the launch of the Mac client, has been downloaded approximately 1.5 million times since May 12 and in a sign that maybe there were a few more underserviced Mac gamers out there than anyone thought, over the past week more than 11 percent of all purchases made on Steam have been for the Mac. But the most interesting statistic is this: According to Valve, "Portal (with the same code base across platforms) is one fifth as likely to crash on a Mac than on Windows." How did Valve come up with that number? No idea, although in all likelihood "crashes per platform" is just one of the many numbers tracked through Steam and forwarded to the studio. On the other hand, I suppose it's possible that some bored Valve guy just threw it out there to see how many arguments he could start. Whatever the case, the studio promised to put out a more complete report on Mac figures sometime next month. In the meantime, Valve has released another set of new games for the Mac including Killing Floor, Hearts of Iron 3, Simplz Zoo and Windosill, all ready and waiting for you at store.steampowered.com.